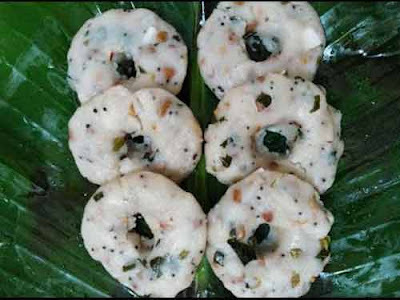 White Karadai or Savoury or Uppu Kara Adai is the dish prepared as an offering during Savitri Nonbu or Karadaiyan Nombhu. It is also the unique food eaten by married women to break the fast during Karadai Nombu. This Adai is a simple dish and it is believed that Savitri cooked the Karamani Adai in the forest while fasting (vratam) to save her husband’s life from Yama, the god of death. There are two varieties of Kara Adai – Sweet and Savoury. The savoury Ada is white in color and sweet one is brown in color. You can read about the preparation of Sweet Kara Adai here. How to Cook Uppu Kara Adai? Roast the rice flour till it becomes off white to light brown color. The consistency should be like the rice powder used in drawing kolam. Keep the roasted rice flour aside. Slightly roast the Karamani. This is to remove the raw taste of the cowpeas. After roasting, pressure-cook till soft and drain the excess water. Add 2tsp oil or little oil to a medium to large cooking vessel. Put the mustard seeds, urad dal, ginger, green chillies and red chilli and make a sauté or give thadka. Add water into the vessel having the sauté and boil. The ideal ratio of water to rice flour is 2:1. Add the rice flour gradually, stir well to avoid lumps. Now add the cooked Karamani, salt, coconut and asafetida and curry leaves. Take the dough off the heat and allow it to cool. When cooled, make a lemon sized ball from the dough and make patties in circular shape. And make a hole in the center. The patties can be made on hand, banana leaf or on butter paper. The size can be 3 inch in diameter and ½ inch thick. Steam patties in an idly cooker for 8 to 10 minutes. Do not put the weight if you are using pressure cooker. The ideal time to remove is when the steam smells of cooked karadai. You can also add cooked Karamani, salt, coconut and asafetida and curry leaves directly into water which has the thadka (mustard seeds etc) and allow it to boil and then add rice flour. Cook the dough is small or medium flame otherwise there are chances that the dough might burn and get stuck in the vessel. If the batter is watery or sticky, stir it in low flame for some more time and it will become ideal when it cools. The Karadai is first offered as an offering (nevediya) to goddess and then it is eaten by married women to break fast. It served along with butter. This is a general idea of making white karadai. You can always alter the steps and quantity. How to cook Sweet Karadai?